Electromechanical thermostats have an important characteristic that makes critical their use in potentially explosive atmospheres: the opening and closing of their electrical contact, which occurs regularly during their normal operation, produces a spark between the contacts. If they are not intended and designed specifically for being used in hazardous areas, their use becomes particularly dangerous because this spark is sufficient to ignite the surrounding atmosphere. Historically, the solution was to use standard thermostats, and enclose them in a cast iron enclosure, with large sealing surfaces and a minimum gap between cover and frame, (described as “d” style enclosures in EN 60079-1, formerly EN50018), so that if an explosion occurred around the electrical contact, it could not extend outside the enclosure. This resulted in heavy, massive and bulky devices because this enclosure had itself to withstand the explosive ignition of the gas mixture which filled it. Although this solution is still used by some manufacturers, JPC has developed over the past 10 years a concept for light and compact products, limiting the flameproof area to the immediate environment of the switch. 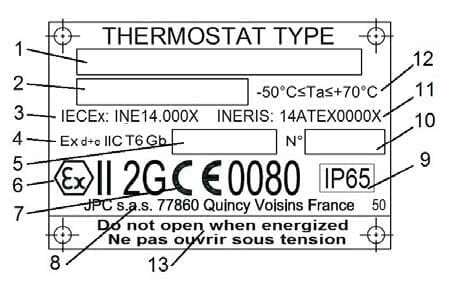 – Thermostats with wires electrical connection: (They are those having the smallest footprint) to allow installation and connection in a increased safety (Ex ‘e’ ) enclosure, but because of their components approval, it is required to apply for an additional approval of the customer enclosure with all its equipment. This solution, although these models of thermostats are the most economical, is therefore valid for large quantities applications only. 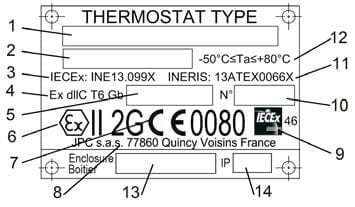 – Thermostats with cable electrical connection: In these devices, the thermostat and cable are considered as a product, and meet the hazardous area requirements if their installation instructions are fulfilled. In particular, they can be used without additional protective enclosure, by, for example, mounting them directly on a panel. It is not necessary to request an additional certificate. This solution also allows mounting the thermostat in a mechanical and ingress protection enclosure, which is not certified as equipment for explosive atmospheres. However, the cable must be mechanically protected, and the connection at its end must be made in a increased safety (Ex ‘e’) approved junction box or outside the hazardous area. – Thermostats with cable electrical connection, inside IP54 or IP65 ingress protection metal enclosures: these enclosures are lighter, less bulky and less expensive than flameproof enclosures Ex type “b” or type Ex ” e ” increased safety enclosures. As the electrical connection is not made in these boxes, they also enable to open their boxes for set point adjustment. However, the cable must be mechanically protected, and the connection to the end must be made in an increased safety (Ex ‘e’) junction box, or outside the hazardous area. These enclosures must necessarily be earthed, and their eventual painting, if it is not antistatic, must comply with the CENELEC R044 -001 § 4.4.4 report that specifies a thickness of less than 200 microns to avoid electrostatic charges. – Thermostats with cable electrical connection, inside IP54 or IP65 ingress protection plastic enclosures: They have the same general characteristics as metal enclosures, but offer better corrosion resistance, and are available with transparent windows. For the same reasons than metal enclosures, they must comply with§ 7.3 of the EN60079-0 standard, which specifies a certain electrical conductivity to avoid the building of electrostatic charges. Some enclosures whose windows, made of non-antistatic plastic, have surface areas between 2500 and 10000mm², can be used , even if the internal thermostat has an approval for gases IIC. The explosion-proof thermostat is installed and connected in an increased safety enclosure, specially designed for thermostat. This solution allows electrical connection inside the housing, but does not allow thermostat set point adjustment by opening the enclosure when energized. The cable exits and the capillary cable gland must be Ex-“e” certified cable glands (which can be selected and installed by the customer), and the terminals are also Ex-“e” certified, and cannot be modified or replaced by other models without cancelling the approval. 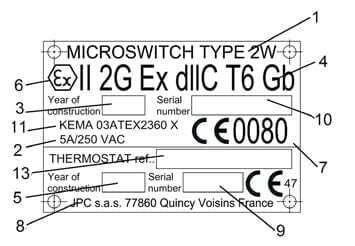 Thermostats types KA, KB, KC, KD, KE, KF, KG, KH, wire electrical connection. Types with protection enclosure must have an additional certificate. 6: Atex logo and code (see detail herunder). 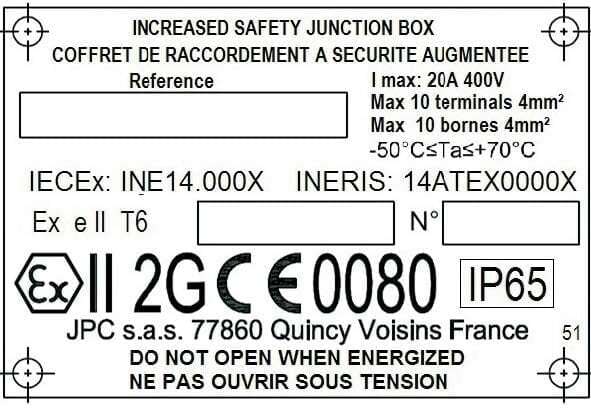 7: Atex code of certified body that has CE approved the quality organization of the manufacturer (code 0080= Ineris). 8: Manufacturer name and address. 2: Electrical features and electrical rating. 4: Gas use code. see detail herunder). quality organization of the manufacturer (code 0080= Ineris). 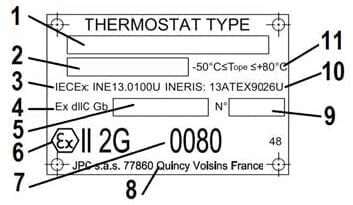 (variable value depending on thermostat models). 4: Gas use code (see detail herunder). This classification of equipment in distinct areas is made according to ATEX 1999/92/EC1: Logo of conformity to ATEX European standard.2: Group II, Equipment intented for use in places with an explosive gas atmosphere other than mines susceptible to firedamp. 3: 2G. Intermittent presence of explosive atmosphere in normal operation (likely) 1: Ex. specific symbol devices for protection against explosion according to EN and IEC standards. Equipment for explosive gas atmospheres, having a “high” level of protection, which is not a source of ignition in normal operation or when subject to faults that may be expected, though not necessarily on a regular basis. 1: Thermostat reference, 13 characters. 4: Gas use code. (d+e marking means that it is an increased safety enclosure including an explosion-proof device)). 6: Atex logo and code (see detail here-over). 12: Thermostat housing min. and max. ambient temperature (variable value depending on thermostat models). 13: Safety warning 1: Thermostat reference, 13 characters.